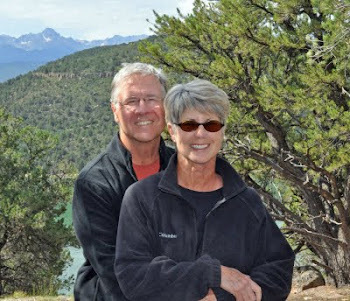 Find us on Google+ Rick and JoAnne's RV Travels: Surgery for Sandy...Again! Oh boy! What can I say about our poor girl other than it is so hard to help one of your best pals when they are hurting. Yep, she somehow tore out all of the stitches in her eyelid. I hate to report this so if you have a weak stomach…better skip this blog post. It looked like you had a piece of raw meat, and sliced it in half!!! Totally GROSS! So, we rushed her to the vet where she had the entire surgery redone. The good news, she was not put entirely under, there are double the amounts of stitches, they are much smaller, and will dissolve. We are going back to the vet this Friday for a recheck. We pray this is going to work as they said this was our last chance at repairing the incision. I guess we didn’t want to know what happens if this doesn’t work – so we are going with this WILL work. Now for those of you who have pets, and the vet puts one of those x-ray type collars on them after surgery – we found a great one the animals can see through, isn’t sharp, and is padded around the neck and all exposed edges at Petco. So far…this seems to be working without the dog (or us for that matter) going insane! I’ll keep you posted on her recovery! On the mend - thanks! Families + Fun = Wonderful Memories! Sandy had Surgery...What do we do? OK…this is some kind of work!